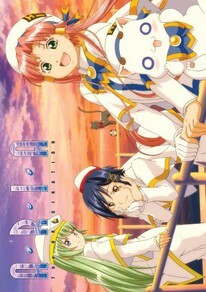 As winter melts into spring, Akari, Aika, and Alice continue to work hard on becoming Neo-Venezia's top gondoliers. Aika starts to take on more responsibility around Himeya, Alice travels up the challenging canal near Hope Hill; even Akari spends a day working on a huge gondola called a traghetto! But there's still so much to learn... and the final test to become a Prima, which once seemed so far off in the future, might not be so far off anymore. Contains all 13 episodes of Aria The Origination plus bonus episode 5.5 as well as the the ~Arietta~ OVA. Special Features: Picture Dramas 1-7, Clean Closing, U.S. Trailer, Cast Discussion, Director Discussion, "Venice, I'm Sorry!" Returns 1-2, Previews.